I hope everyone had a Happy Thanksgiving. Are you all “turkeyed” out? Did you eat way too much? I did, but it was absolutely worth it. We got back in town last night and our boys insisted we get our tree and house decorated, so we did. I really wish I would have had some of these Peanut Butter Oatmeal Chocolate Chip Cookies left because they would have been the perfect thing to be snacking on while the fire was lit and we decorated. I made these cookies last week and I’m ready to make them again. They are so, so good . . . I’m talking could eat the entire batch kind of good. 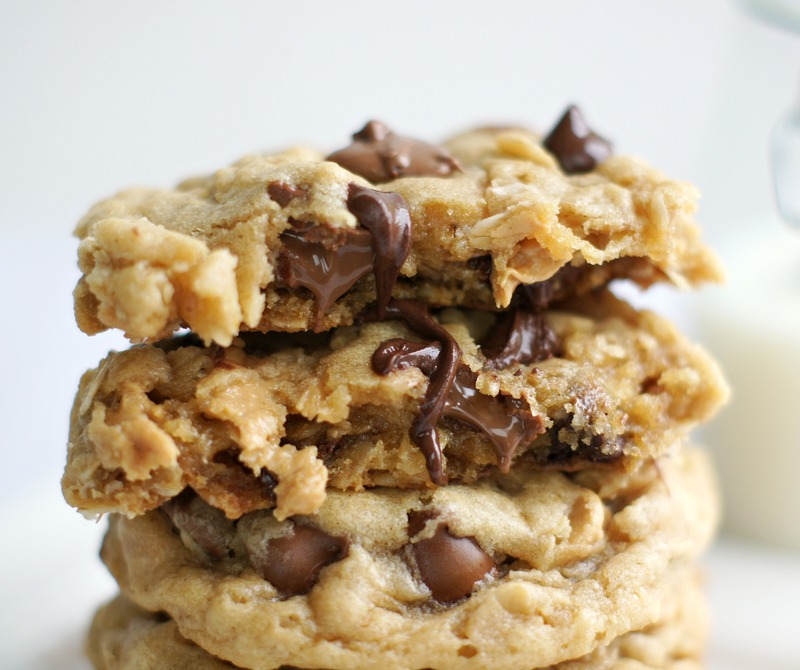 They are thick, soft, chewy and packed with oatmeal and chocolate and peanut butter chips. 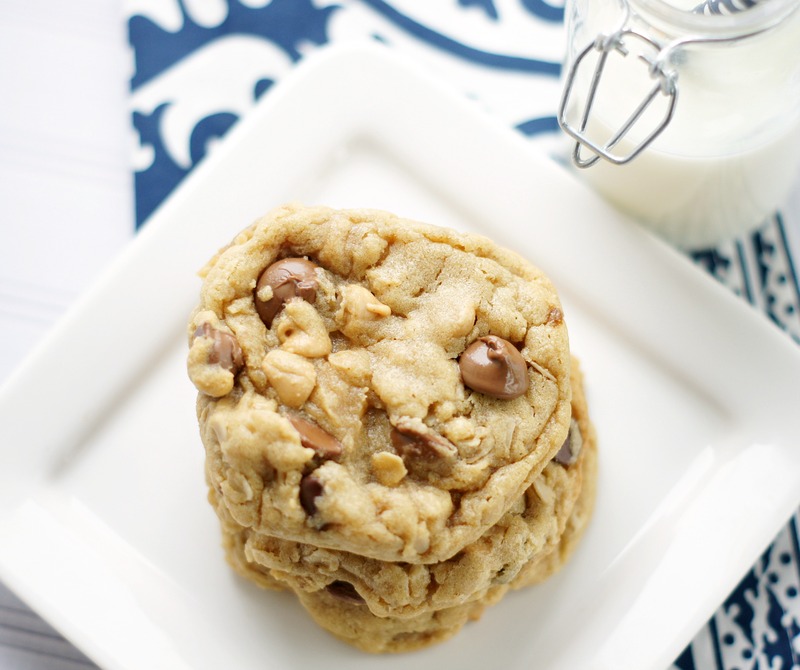 These cookies are seriously so, so good. Feel free to make them smaller than the directions say, but I say the bigger the better! In a large microwave-safe bowl add the butter, peanut butter, and heat on high power to melt, about 1 minute. Stir and cook in 15-second increments if needed, until mixture is smooth. Let cool about 5 mins. Add the egg, sugars, vanilla, and whisk until combined (mixture will be slightly grainy). Add the oats and stir to combine. Add the flour, baking soda, salt, and stir to combine; don't overmix. Dough will be fairly thick. 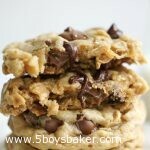 Add the chocolate chips, peanut butter chips, and stir to incorporate. Preheat oven to 350F, line a baking sheet with a Silpat liner or spray with cooking spray. Place dough mounds on baking sheet, spaced at least 2 inches apart (about 8 cookies per sheet) and bake for about 11 to 12 minutes (for very soft cookies, longer for more well-done cookies), or until edges have set and tops are just set. They may look sligthtly undercooked, that's ok, you don't want to overbake. Cookies firm up as they cool. Allow cookies to cool on baking sheet for about 5 minutes then place on cooling rack. It's important that this dough chills for 2 hours before you bake them, otherwise you will have flatter, thinner cookies, so make sure you plan ahead. What if I don’t have the peanut butter chips? Add more chocolate chips or creamy peanut butter? Hey Michele, I would just add more chocolate chips. Adding more peanut butter will change the texture of the dough and you’d probably end up needing to add more flour. Good luck.